Spiral welded pipe is a special method of pipe manufacturing in which a steel coil is formed and welded using what is known as a DSAW method to create varying outside diameters and wall thickness of steel pipes. 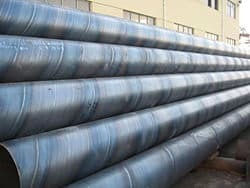 There are many advantages to spiral pipe and one of the main advantages is that different diameters can be made from the same steel coils and lengths can be custom made to fit any job requirement. At P.I.T. Pipe, we supply a complete variety of types and sizes of spiral pipe to meet all of your needs. We stock a huge selection and variety of sizes, lengths, diameters, and different types of spiral pipe including the most common sizes ranging from 18” to 126” in diameter and from .25” to 1” in wall thickness. We can even supply pipe in lengths up to 150’ long. If you need spiral pipe in any dimension or length, then P.I.T. Pipe can supply you with what you need to get the job done. We sell a huge variety and if we do not have it on hand, we can locate or fabricate it for you. We will deliver your pipe directly to your jobsite. P.I.T. Pipe also carries a wide selection of surplus and used steel pipe in stock. Contact us at P.I.T. Pipe today for all your steel and metal pipe needs and to see how we can help you. Over the last few decades, spiral pipe has come a long way in the way that it is manufactured. Spiral pipe used to be much harder to cold bend and would often buckle, making manufacture difficult. Now, due to better manufacturing processes, it can be bent even easier than straight seam steel pipe. Spiral pipe also has close outside diameter tolerances and is just as easy to weld as regular steel pipe. Spiral pipe can also be coated just like regular pipe with no problems. This type of pipe has been used in major pipeline systems around the world, and even has the same pressure capacity as straight seam pipe. Spiral pipe also has the most beneficial properties to stop a running crack thanks to the spiral structure of the pipe. Because of these benefits, spiral welded pipe is used in a wide variety of applications. As a leading steel pipe supplier, P.I.T. Pipe can supply you with all of the pipe you need to meet your needs. 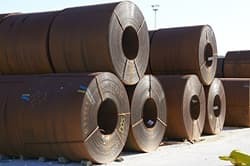 We carry a large supply of steel pipe, steel tubing, I-beams, steel plates, and other structural steel items. We can have anything custom cut, fitted, and fabricated to meet your specifications. We also have a large selection of surplus and used steel pipe available at affordable prices. Contact us at P.I.T. Pipe today to learn more about our selection of spiral pipe and for all your structural, steel pipe, and metal pipe needs. Copyright P.I.T. Pipe - All rights reserved.